In 2013, Hand in Hand for Syria was the first to diagnose the re-emergence of polio in Syria after it was eradicated in 1999. Since then, we’ve been working on a two-pronged campaign to treat existing cases of polio and to vaccinate healthy children against it. Children under the age of 5 are at the greatest risk of polio. Dr B. A. is our director of medical projects for Syria: “Suddenly to find a very old, very rare disease affecting children, that we had only heard of on the news — we were completely in shock. It’s the worst disease for a child: not to be to do anything. Not to be able to play, or play football with your friends. There have been 25 laboratory-confirmed cases of polio in Syria, with a further 13 pending confirmation. However, many doctors working there think the number is much higher: at least 110 children affected. Accessibility to laboratory testing is extremely difficult, which explains the discrepancy between data supplied by the WHO (based purely on lab confirmations) and suspected cases (which are based on clinical symptoms as identified by medics in the field). Polio-vaccination rates in Syria before the war were at 91%, but had fallen to around 68% in 2012. However, in rebel-held areas, where all the polio cases so far have occurred, vaccination rates are considerably lower. Doses of vaccine must be refrigerated right up until the point of administering, which makes it especially difficult to reach children in areas under siege. Little Muhammad is five months old. His parents, from the north-western province of Idlib, an area particularly hard-hit by the conflict, are desperately poor. To their devastation, they recently found out that Muhammad has a disease from which he will never recover — a disease they had never even heard of: polio. Now they’re only too aware of what this means for Muhammad and for the whole family. Hand in Hand for Syria brought baby Muhammad out of Syria and into Turkey for the tests he needed to confirm the disease, and for treatment in an isolation ward. He also had some physiotherapy, which returned a little movement to one of his arms, but his parents fear this is only a temporary reprieve. There is no physiotherapy available to Muhammad in Syria. And now, because of heavy shelling, the family has had to move from home to a refugee camp. Because of the conflict, conditions in Syria were ideal for the re-emergence of polio. Attacks on doctors and the medical infrastructure have destroyed vaccination programmes. The clean-water infrastructure has also broken down, and children’s immunity has been weakened due to malnutrition. The polio virus lives in water, contaminated food and sewage. It can be spread by flies, coughing, and human contact. With summer approaching, the higher temperatures present a heightened threat of the spread of polio. To make matters worse, the Syrian government initially refused to accept that Syria was affected by polio. Many doctors in Syria believe the government withheld vaccines in the opposition-held north, turning polio into a weapon in a kind of biological warfare against the people. Although there is now an urgent campaign across the Middle East to vaccinate 23 million children, it is currently impossible to reach all of Syria’s children. Health workers are at risk: 2 vaccinators have been killed, and another lost a leg in an explosion. 3 million people live under siege in Syria, where vaccines can’t be taken in and where polio therefore cannot be eradicated. The big concern is that for every victim, there are at least 200 people (and some doctors say up to 1,000) carrying and spreading the virus. All of the polio cases in Syria have occurred in the north of the country. 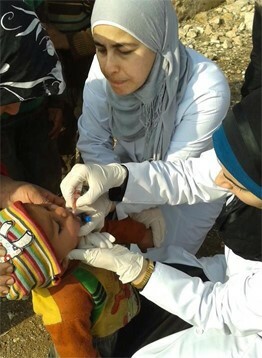 Each of our hospitals in northern Syria has a vaccination clinic for polio and other diseases, and a dedicated team from our children’s hospital at Atmeh also goes out into the refugee camps near the border with Turkey border 6 times a month; this team alone has now vaccinated around 10,000 children against polio. We detected the first new case of polio in Syria at our hospital in Deir-Al-Zour. In November 2013, we subsequently ran a large vaccination campaign in the area and also distributed 750 hygiene kits and 15,000 leaflets about polio and how to avoid it. For everyone’s sake, please make a donation today. Help us to care for more polio victims like Mohammad, and to immunise more children. • Read Tim’s article Polio in Syria: An outbreak that threatens the Middle East‘ on the BBC website.